I have always loved the way that collared shirts look under a contrasting short-sleeve or sleeveless layer. And sweater-vests are always cool in a kind of nerdy un-cool sort of way. 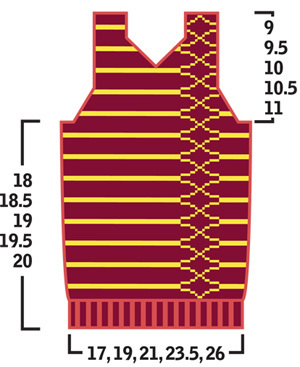 Hence, this design (which is intended to look like a sweater-vest over a collared shirt) was born. Two different types of color work are used in this sweater. 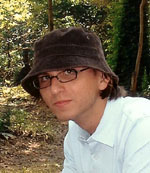 The back and most of the front are worked in stripes, with a 16-stitch panel on the front worked in a stranded pattern. You may wish to use separate balls or bobbins of each yarn for working the stranded section. Using US 6/4mm needles and MC, CO 72[80, 90, 100, 110] sts. Work 18 rows in 1x1 Rib, ending with a WS row. K12[14, 16, 18, 20] sts using MC, place marker, work 16 sts of stranded color work panel as indicated, place marker, k to end using MC. The stitch markers delineate the color work panel. Continue working in patt as set, working sts between markers in stranded pattern and remaining sts in stripe pattern as indicated, until work measures 18[18.5, 19, 19.5, 20] inches, ending with a WS row. BO 3[3, 4, 5, 6] sts at beg of next 2 rows. 66[74, 82, 90, 98] sts rem. Next Row [RS]: K1, k2tog, k in patt to last 3 sts, ssk, k1. P 1 row in patt. Repeat these 2 rows 6[7, 8, 9, 10] times more. 52[58, 64, 70, 76] sts rem. Cont in patt until work measures 23[23.75, 24.5, 25.75, 26] inches (armhole measures 5[5.25, 5.5, 5.75, 6] inches), ending with a WS row. Next Row [RS]: K26[29, 32, 35, 38] sts in patt, place all sts just worked on st holder, k in patt to end. 26[29, 32, 35, 38] sts on needle. Repeat these 2 rows 6[7, 8, 9, 10] times more. 19[21, 23, 25, 27] sts rem. Cont in patt until work measures 27[28, 29, 30, 31] inches (armhole measures 9[9.5, 10, 10.5, 11] inches). BO all sts. Note: Because if the type of shoulder shaping used for this sweater, the front will be longer than the back. Replace held sts on needle with WS facing. P 1 row in patt. Work 18 rows in 1x1 Rib. Using US 8/5mm needles, work 4 rows in stockinette st.
Work 2 rows using CC1. Work 8 rows using MC. 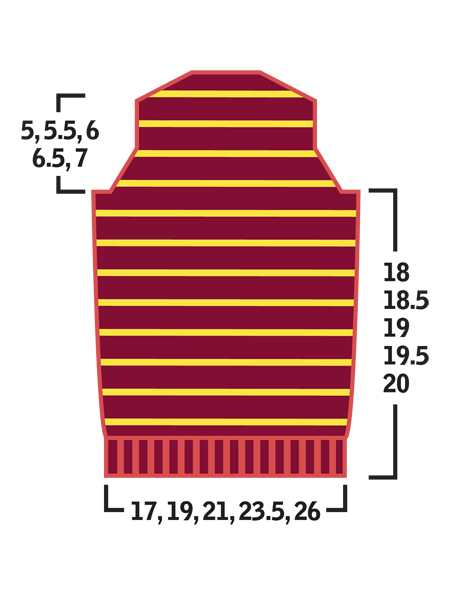 These 10 rows set Stripe Pattern; maintain this pattern throughout the Back. Cont in patt until work measures 18[18.5, 19, 19.5, 20] inches, ending with a WS row. Cont in patt until work measures 23[24, 25, 26, 27] inches (armhole measures 5[5.5, 6, 6.5, 7] inches), ending with a WS row. Next Row [RS]: K1, k2tog, k to last 3 sts, ssk, k1. Repeat these 2 rows 6[7, 7, 8, 9] times more. 24[26, 32, 34, 36] sts rem. Work RS decrease row once more: K1, k2tog, k to last 3 sts, ssk, k1. 30 sts rem. Using US 9/5.5mm needles and 2 strands of CC2 held together, CO 32[36, 40, 44, 48] sts. Work 20 rows in garter st.
Work 4 rows in stockinette st, ending with a WS row. Work 9 rows in stockinette st.
Repeat these 10 rows 8 times more. 50[54, 58, 62, 66] sts. Cont in stockinette st until work measures 20[20.5, 21, 21.5, 22] inches, ending with a WS row. BO 3[3, 4, 5, 6] sts at beg of next 2 rows. 44[48, 50, 52, 54] sts rem. Repeat these 2 rows 14[15, 16, 18, 17] times more. 14[16, 16, 14, 18] sts rem. Next Row [WS]: P1, p2tog tbl, p to last 3 sts, p2tog, p1. Repeat these 2 rows 1[1, 1, 0, 1] time more. 6[8, 8, 10, 10] sts rem. Using US 9/5.5mm needles and 2 strands of CC2 held together, CO 8 sts. Mark RS with safety pin. Repeat these 6 rows twice more. 5 sts rem. Cont in garter st until work measures 9[9.5, 10, 10.5, 11] inches. BO all sts. Next Row [RS]: K to last 2 sts, ssk. Sew straight bound-off upper edges of front to shaped upper edges of back. The bound off upper edge of the back forms the back neckline. Sew sleeve seams, leaving garter st cuffs open. Sew bound off edges of collar together -- be sure right sides of both pieces are facing the same way, so that shaped edges are on the same side. Sew shaped edges of collar along neckline, centering back seam of collar, with cast on edges meeting at center front. 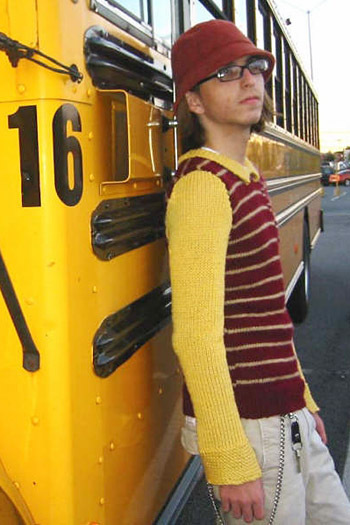 Ryan Marnell is a high school student and international knitting star. You can visit him at his website.